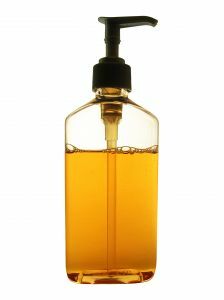 Natural Shampoo Recipes: How to make shampoo for Color treated hair. Use this recipe for brown or black hair to add shine and depth to your color. Directions Steep the sage, rosemary and black tea with water in a covered pan for 30 minutes. Strain and allow to cool. Mix with remaining ingredients then bottle. 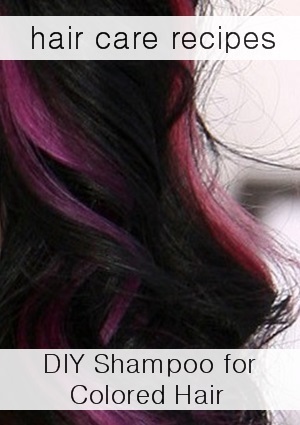 Homemade shampoo is perfect for color treated hair. You have the ability to customize your shampoo to make it as gentle and moisturizing as your dyed hair needs. The number one culprit to hair color fading is sulfate. DIY shampoos do not contain these stripping agents. Chamomile Shampoo Recipe: Great for blondes to brighten light hair! Directions: Steep the tea bags in 1 1/2 cups of boiled water for 20 minutes. Remove the tea bags and discard. Add the soap flakes to the tea and let stand until the soap softens. Stir in glycerin until well blended. Keep in a dark, cool place in a sealed bottle. This recipe is great to add red highlights to brown hair or enhance natural red hair. Directions: First make an infusion with the root, flowers and water. Boil down until you have about a 1/2 cup. Allow to cool. Mix the remaining ingredients and shake well. This homemade shampoo is perfect to help blend grey hair and will soften the wiry texture of your hair. Hemp seed oil is full of protein which softens hair by replacing the protein your hair looses when it looses pigment and turns grey. Directions: First make an infusion with the sage, rosemary and water. Boil down until you have about a 1/2 cup. Allow to cool. Mix the remaining ingredients and shake well. Directions: First make an infusion with the chamomile flowers and 1 cup water. Boil down until you have about a 1/2 cup. Allow to cool. Mix the remaining ingredients and shake well.